Much has happened in the Mountain State since Sutton bookseller Richard C. Weigen and his New Jersey friend and crime writer, Gerald Tomlinson, produced the first The West Virginia Book of Lists in 1994. The state has produced a new generation of noteworthy actors, athletes and authors, and built an abundance of new buildings, bridges and businesses. There has also been a new series of high-profile crimes, natural disasters, mining explosions and political scandals. Some things never change, like the longest rivers, biggest lakes, highest peaks and towns with odd names—including Odd in Raleigh County. In many cases, decisions on which people, places and things to include in this book were straightforward and research-based, while in others, the decisions were more subjective. Holes can appear in some lists in instances where a reader's point of view is not the same as the author's. If some of the listings seem trivial, keep in mind that this is, after all, a compendium of trivia, so they probably are. While it's possible this book may solve some arguments, the idea is to create more of a "huh!" than a "gotcha!" And while it's a safe bet that the National Book Award will go to another author this year, I hope you like this book, and that it finds a home, if not in your bookcase, on your fishing camp windowsill or bathroom shelf. Although it may not be ideal for serious readers, it's intended to appeal to, those, like me, who have a special place for West Virginia in their hearts, regardless of where they live or where they were born. --What fish species was involved in a 70-pound state record catch from the Little Kanawha River in 1956. --The West Virginia state forest where a state single-season snowfall record of 302.4 inches was recorded. --The identity of the Logan County native and Marshall University alum who earned a Silver Medal in the 2002 Winter Olympics. --The names of the West Virginia gardeners who grew the state’s biggest mushroom (9.83 pounds) and the state record watermelon (142.5 pounds), and the vital statistics for a host of other super-sized fruits, vegetables and herbs. --Which West Virginia Civil War battle involved the first field use of the telegraph and the first tactical use of the railroad to move troops to the battlefield. --At what West Virginia television station “Today Show” host Matt Lauer began his broadcasting career. CHARLESTON, W.Va. -- Readers of the Sunday Gazette-Mail know Rick Steelhammer from his weekly humor column. However, many readers may not realize that Steelhammer is also an author whose books show much the same offbeat slant. Steelhammer has been a reporter at the Gazette for more than 30 years and a columnist for nearly that long. "In addition to working for the Gazette," he says, "I have served as news editor of a tiny weekly newspaper in Heppner, Ore.; worked for the now-defunct Dayton Journal-Herald while attending (and eventually graduating from) Antioch College; worked on the lobster boat Kingpin in the Gulf of Maine; was a copy boy (now called 'news aide') for Newsweek magazine, and operated a backhoe for a landscaping crew at an Oregon golf resort." Over the years, Steelhammer has traveled to each of West Virginia's 55 counties to cover news and feature stories for the Gazette. Obviously, he's done most of that traveling by car. But, tucking his tongue firmly in his cheek, he notes that he's also traveled by "plane, helicopter, raft, canoe, kayak, train, speeder car, horse, skis, snowshoes, zip line and on foot." In 2010, he took some of the quirky characters, roadside oddities and other offbeat stuff he found during his travels and packed them into a book, "West Virginia Curiosities," published by Connecticut-based Globe-Pequot Press. Next year, Globe-Pequot is scheduled to publish another volume by Steelhammer, "It Happened in West Virginia." In the meantime, Charleston's own Quarrier Press has issued a slim little paperback by Steelhammer that surely will be welcomed by West Virginia trivia buffs. 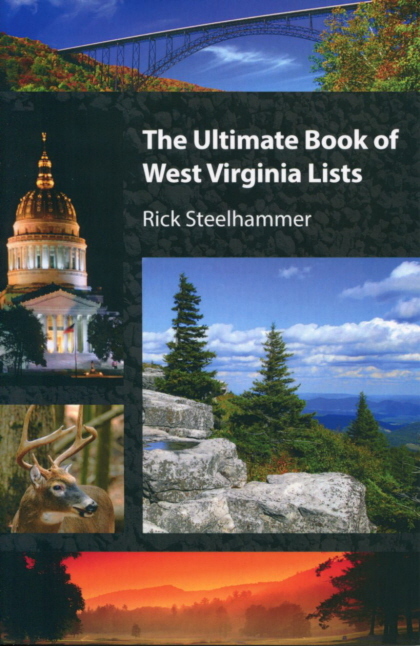 Steelhammer's "The Ultimate Book of West Virginia Lists," updates and broadens the scope of "The West Virginia Book of Lists," released by Richard Weigen and Gerald Tomlinson in 1994, and long out of print. "A lot has happened in the 18 years since the first 'Book of Lists' was published," says Steelhammer. "While some things never change, like the longest rivers, the highest peaks and the towns with oddball names, there's a new generation of athletes, actors and authors with West Virginia roots." Entries in the book range from the obvious to the arcane. Where else would a reader find a listing of state records for garden crops, like a 142.5-pound watermelon and a 9.6-pound turnip? "I was surprised at the large number of business and government leaders with connections to West Virginia," says Steelhammer. "It was inspiring to find out that a guy like William Batten, who grew up in Reedy in Roane County ended up becoming the CEO of J.C. Penney & Co., plus the chairman of the New York Stock Exchange. Before doing the research for this book, I thought Cyrus Vance, who served as secretary of state under Jimmy Carter, was the only West Virginia native to hold a Cabinet post. It turns out there were at least five more." While Steelhammer concedes it's a safe bet that the National Book Award will go to another author this year, he hopes his little book is worthy of a home, "if not in your bookcase, on your fishing camp windowsill or bathroom shelf."